About two weeks ago, it became clear the final version of Firefox 3.6 would be pushed back to early 2010 . And we've known since September that Firefox 4.0 wouldn't ship until late 2010 -- although according to Mozilla's most recent meeting notes 4.0 may be pushed back to early 2011. But while we wait for the official versions of these browsers to come out, let's take a look at what's in store for the world's second-most popular browser. Mozilla originally planned to follow 3.6 with Firefox 3.7 in Spring 2010, but that will no doubt be pushed back with the delayed release of 3.6. That's too bad, since 3.7 is supposed to have a few more user enhancements than 3.6 including bookmark synchronization (something you can already do with the Xmarks add-on ), run Websites as an application (I'm guessing this is something to do with Mozilla Prism ), and task-oriented browsing. By next summer Mozilla hopes to have the first beta version of Firefox 4.0 available, which should be the first version of the open-source browser to have a user interface native to Windows 7. Other features include integration with Jetpack (now in Mozilla labs) and a new browser sync tool called Weave. The new sync tool is all about a "seamless experience back and forth from your PC to your mobile phone," Jay Sullivan Mozilla's vice president of mobile recently told the BBC . Describing Weave, Sullivan explained that you would be able to leave your desktop or laptop computer, get online with your smartphone using Mozilla's upcoming mobile browser, Fennec , and be able to view the open tabs you just had on your desktop. Weave will also include the bookmark synchronization slated for Firefox 3.7. But one of the more interesting things I've noticed about Mozilla, and something that will become much clearer with Firefox 4.0, is its interest in borrowing features from Google Chrome. The most obvious Chrome imitation is the "tabs on top" look that is being considered for Firefox 4.0, which will make Firefox's overall look very similar to Chrome. Another Chrome borrow for Firefox 4.0 will be the separate processes feature that will prevent one crashed tab from taking down the entire browser. 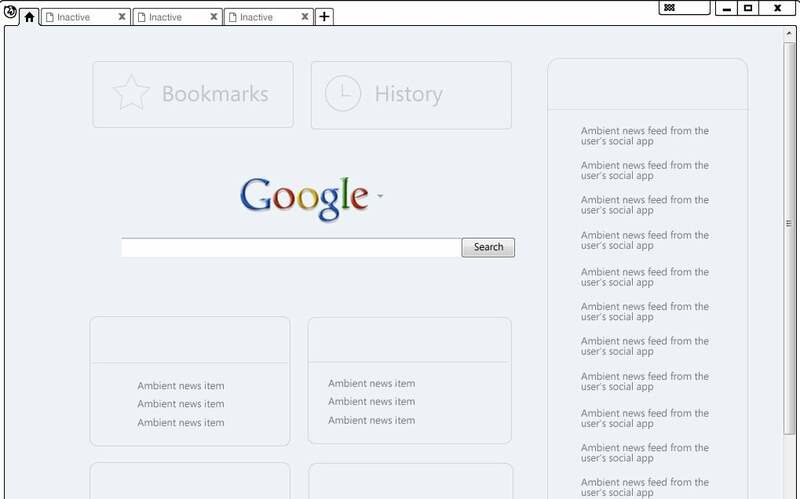 Then there's the Home Tab project that may come appear as early as Firefox 3.7. Home Tab will basically be similar to what you see when you open a blank tab in Chrome with easy access to browser history and popular bookmarks. I should note that most browsers have a similar feature, including Safari, Opera, and Internet Explorer 8. 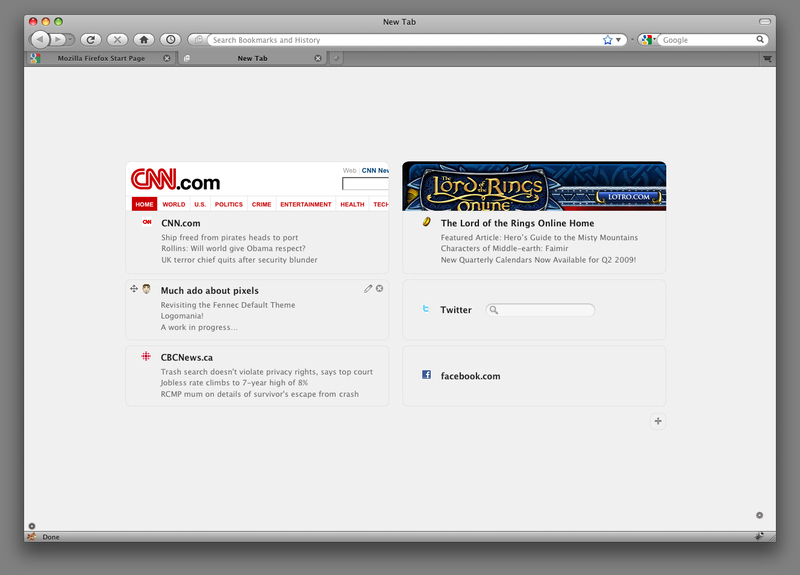 But Home Tab may also include social networking feeds alongside your bookmarks and history. Check out this early mock-up image of Home Tab below, and note the Chrome-styled browser tabs. You can also see another concept version here . Mozilla has some interesting tricks up its sleeve, and while you're waiting for the new versions of Firefox, you might as well check out Mozilla's projects page to see some of the features planned for Firefox's future.